Super professional. Very polite, very prompt, excellent attention to detail. This was my experience with everyone at Sunnyside. We had some bad work done by another company and after 3 attempts to correct it, couldn't trust them to get it right. Called Sunnyside and they came out and fixed everything within a few hours. They provided pictures and video of the problem areas and were incredibly thorough. We will continue to use their services and recommend anyone else to do the same. These are my go to guys! We have been using these guys for years. Couldn't be happier and have absolutely no criticisms whatsoever. They are prompt, courteous, professional, reliable and they do an amazing job. The price can't be beat either. My wife runs a daycare out of our basement and as you can imagine the carpet takes a beating. A couple times a year we use these guys to make it look brand new again. I would personally recommend their services to anyone and will most definitely continue to use their services in the future. This isn't the first time I've used waterworks, but it's the first review I've written for them. I've used their services twice now over the past month and each time they exceeded my expectations. Their staff was prompt, courteous, helpful and incredibly detail oriented. The end result was always very high quality. In this particular instance I had a problem with a previous general contractor/handyman whose work was repeatedly problematic. The work he did was failing miserably and we needed the problem solved asap. Nathalie helped me get one of their technicians out on very short notice (on a weekend nonetheless) who came out and immediately spotted the problem and corrected it. He was also kind enough to point out remaining issues with the previous contractors work and explain to me how to correct them myself. These guys are pros. If you want it done right and don't want to worry about hiring unreliable, sketchy people these guys and gals are exactly what you're looking for. Michael, Larry, Vos and Nathalie... Thank you for taking care of me and my family. We really appreciate it. Thank you for you continued loyalty Matt. We really appreciate your compliments. Your satisfaction is really motivating and appreciated by all of us. We look forward to serving you or answering any of your questions should you need us in the future. We're always a phone call/email away. From Vas and the Waterworks family. Are all of these reviews fake? This is my first negative review for any service EVER. I can't believe the reviews on this site. Seriously. I after my experience with this guy I have to assume all of these reviews are written using fake accounts. We had a mold problem that required partial demolition of our kitchen. I hired KC to help me put the kitchen back together and install a base cabinet for my kitchen sink, reinstall the sink/counter-top/dishwasher and fix some tiles on our back-splash. I was quoted that the job would take less than a day to do. 11 days later and I'm left with the "quality craftsmanship" you can see in the attached picture. Isn't it beautiful?? We tried to be as patient as we could with KC, but time and time again he let us down. I can't count how many times he showed up late, or didn't even show up at all. Neglecting to even call us. Each time he came out to the house he promised it would be the last time, yet each time he found a way to stretch the labour even further and tell us he'd have to come back again. We had no choice but to fire him. After firing him our $800 quote mysteriously turned into an $1800 bill along with a series of threatening text messages. 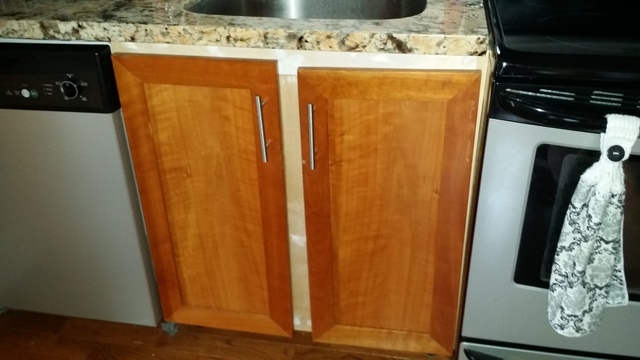 He measured the cabinet wrong, I told him it was too large that I had bought the wrong one, but he said I was wrong and that I should trust him because he has 36 years of experience. Sure enough when it came time to put on the doors it was obvious the cabinet was too large. We spoke about a solution but the one provided was horrible and we simply had enough of the disappointments. Please don't make the same mistake I did. Find someone else who to do what you need. When you don't want to communicate, when you bombard me with me with texts at 3:30 in the morning knowing I've 4 very young children, when you refuse to talk, how could I possibly say anything that would satisfy you. By Wednesday night that 95% of your project was complete, everything was great and you were very happy, but come Friday night, all hell breaks lose because you knew its time to pay, suddenly we then become awful and bad, and you just happen to be the victim here!!!!! Did I not say to you, as I say to all our other clients, that we will not leave until you are fully satisfied !!! I told you that it still requires stain and door adjustment but you shut the door on us, and were looking for an excuse NOT to pay your bill, yet, you have the audacity to leave this kind of remark on Homestars? Shame on you Matt, have some decency and say the truth about what your real intentions were from the beginning. Thank goodness our record speaks for itself.